Sunday – Paris to Dijon. Monday - Cruise to Longecourt. Visit Clos de Vougeot with Jeep drive through the vines. For those who have a little more energy, we can stop at a truffle producer and learn how the black diamonds grow and then how to find them. We return to the Apres Tout for a well-deserved refreshing cocktail! Tuesday - Cruise to Dijon. Visit Dijon. This morning we visit Dijon, a wonderful town with a long and interesting history. As it is market day, the center is thriving with traders selling their produce and shoppers meandering taking in the atmospheric feel of this magnificent city. There is plenty of time to shop in the city’s many chic boutiques or sit in a pavement café and watch the world go by. Later, we will visit the Grey Poupon mustard shop for a tasting of this famous product and then take a walk through the historic area of the town which will captivate you with its historical past, including the Ducal Palace. 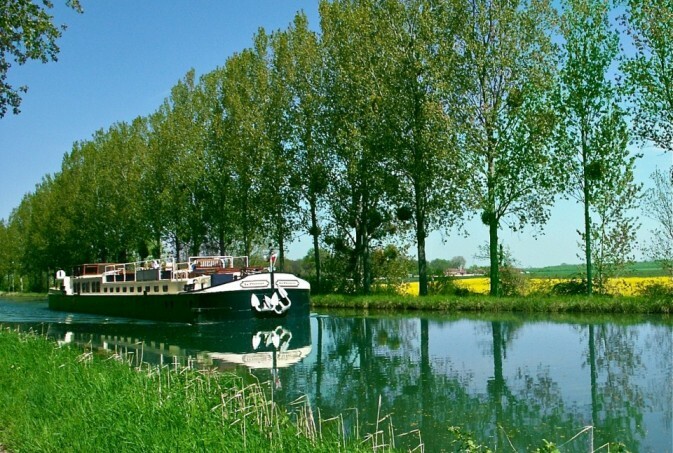 We return to the barge for lunch and an afternoon cruise into Dijon, where we moor for the evening. Leaving Dijon behind we continue our canal cruise to the valley of the Ouche. Enjoy a relaxing morning on board; there are many locks for dis-embarking to cycle or to walk. Late morning you transfer over the hillside and down through the vines to the charming village of Gevrey Chambertin. We are greeted by the owner of this prestigious Grand Crus wine makers, and here we have a splendid lunch on their terrace overlooking their vines! During lunch Madame Drouhin Laroze (the owner) will present her wines. This is truly a very unique experience. After lunch, we are given a very informative private tour of the cellars. We then take a scenic drive along the famous ‘Route du Grand Crus’, Passing through many of the famous wine villages. The morning is spent cruising through the lovely Ouche Valley, this is a truly spectacular part of the canal, small villages pass by, cows wander in the fields, and there is nature all around. There is a total feel of peace and tranquility as we slowly cruise this magnificent canal. After another wonderful lunch, you are transferred to the delightful town of Beaune, the capital of the wine region of Burgundy. Enjoy a visit to the famous Hôtel-Dieu, Hospice de Beaune with its interesting history and magnificent tiled roof. After some free time for shopping or strolling in the pedestrian streets we have an optional appointment for a private wine tasting at the famous cellars of Joseph Drouhin, this tour is by invitation only. Later, we return to the barge for a refreshing cocktail and freshen up before one of the high lights of the week, a gourmet dinner at the stunning Abbaye de la Bussiere. This Relais & Chateaux property has been beautifully transformed from a Cistercian abbey into a fabulous hotel, set in architectural grounds where you will dine in style tonight. 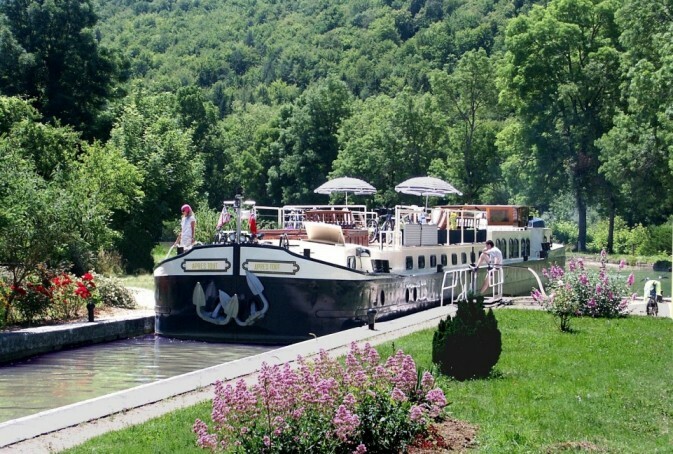 Friday - Cruise to Pont d’Ouche. Visit Châteauneuf-en-Auxois. 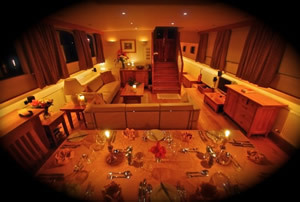 Apres Tout is a 38 metre luxury hotel barge, designed and built to the highest standards. 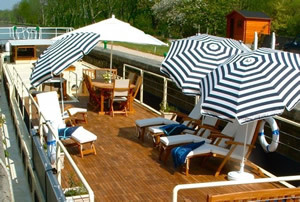 Retaining the classic shape and charm of the original French barge, Apres Tout offers luxurious comfort with accommodation for 6 guests in 3 spacious air conditioned staterooms. 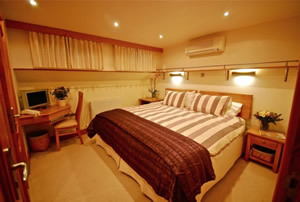 The salon and dining area are tastefully furnished in light oak and are very bright and spacious. The salon features large opening windows, a sky light, Bose sound system and a flat screen tv with satellite. A study features a computer with internet access.